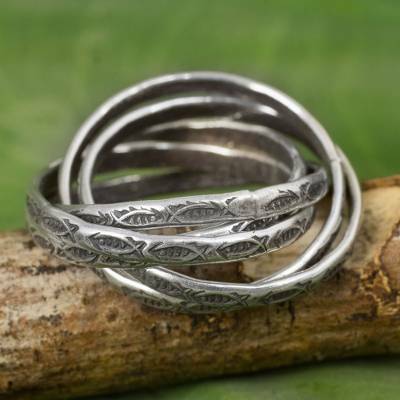 Five Interlinked Fish Theme Hill Tribe Silver Rings, "Five Karen Rivers"
Traditional hill tribe chic permeates a set of five original rings from Achara. Crafted by hand, the narrow silver bands feature fish motifs and are interlinked to wear together. You can find silver band rings 'Five Karen Rivers' (set of 5) by Achara in jewelry categories such as Hill Tribe Rings, Animal Themed Rings, No Stone Rings, Silver Rings, Sterling Silver Rings and Band Rings. Enjoy exploring these sections for other Novica treasures. I received this yesterday and haven't taken it off since! It is just what I have been looking for and beautifully made. Because it rolls, it fits perfectly and is very comfortable. It arrived quickly and was package well. I would recommend this highly. Lovely cluster of silver rings. I love the fish design.